When I found out that I was losing my job due to outsourcing, I decided that I needed to do something drastic. I needed to drop everything and go to New Orleans, at least for a week. You see, I hated my job, but I had become complacent. I had learned to live frugally, so the meager income I earned was sufficient to cover all of my expenses, and even save a little, where many of my coworkers struggled from paycheck to paycheck. The hours were reasonable and consistent, so it was easy to get on a schedule and stick to it. I wanted to be doing something else with my life, and I certainly wanted to increase my income, but I was so exhausted each night when I got home that it was easy to decide that “good enough” was good enough. Right about the time that I decided that I’d be growing old and dying in my little corner cubicle in this nondescript office building, we were informed that our client was moving the contract to India in three months. Why? Cheaper labor. Many were crushed by the news, but I was glad to be getting out. I hadn’t had to courage to quit my job (“Is my emergency fund large enough?” I’d worried), but now I had a scapegoat. They were laying me off. I had no choice but to do something else. A vacation sounded like the right way to get my jobless life off to a good start. I didn’t have a budget for vacationing. My income was meager enough that I didn’t really see vacationing anywhere on the horizon. As well, I had never flown or solo traveled, and the thought of both frightened me a little. Still, I wanted to face these fears, and I wanted to find a way to do it without draining my emergency fund. I believed that if I got creative enough, I could travel for cheap. What I found out, however, is that I could travel for free. I decided that food, lodging, and transportation would be my greatest expenses, so I set out to map those costs. I first checked out airbnb.com, knowing that hotels would be out of the question. The lowest price I could find was $60 a night, and since I had decided to stay for a week, I knew I wouldn’t be able to afford that price on my $0 vacation budget. I decided to look at hostels instead. For $113.50, I could stay a whole week in a conveniently located hostel with good reviews. I decided that that was the maximum I would be willing to pay, and that I would fall back on this hostel if I could find nothing cheaper. But could I find something cheaper? Our good friends at CouchSurfing.org were the answer. I had hosted a couple of surfers since finding the site, and I anticipated that this would be my best option come time to do traveling myself. I was right. It does take some legwork to track down hosts for a whole weeks worth of accommodation, but it’s worth it. On top of having a safe place to sleep on the cheap, you also meet amazing people, and get directed to the sights worth seeing. Tour guide not required. Seven days and six nights in New Orleans, grand total: $0. Note: CouchSurfing is a place for cultural exchange. Make sure you’re in it for the right reasons. Most people won’t let you stay with them if they find out that you’re just looking for a place to crash, so choose the hostel if you don’t want to spend any time getting to know your host. And besides, getting to know a local is the fastest and easiest way to learn the ins and outs of a new city. My host saved me a ton of headache, and took me on some great free tours! Enter Frequent Flyer Miles. But I’m not a frequent flyer, as you may recall. I’d never flown, and the thought of flying was a little nerve-wracking. Having read my share of information on travel hacking, however, I knew there was a free flight out there with my name on it. In fact, there were several free flights with my name on them. Just about every major airline has a frequent flyer rewards credit card, and most of them offer up enough points for a free domestic flight after your first purchase. I have only one other card which I pay off before I ever see a statement, so I knew that I wouldn’t have any issues with racking up debt. Getting the credit card was no issue for me. I went with Southwest Airlines Rapid Rewards® Plus Card since the terms of their frequent flyer program were the least restrictive: you get 25,000 points after your first purchase (worth $400 in fares), the number of points required for a rewards flight is relative to the cost for that flight, and you get 3,000 free miles each year (which offsets the annual fee, endemic amongst frequent flyer credit cards, by 72%). The only downside is that Southwest isn’t part of an airline alliance, and they don’t offer international flights, so if you want to get serious about international travel hacking you might want to look elsewhere. Because I already found the cheapest dates for flying to New Orleans, and because the number of points required for a flight on Southwest is relative to the cost of the ticket, I was able to snag a round trip flight for considerably less than the 25,000 points I was awarded. I even have enough that I can take a second round trip flight using one of their advertised deals, so long as I’m not picky about the destination. Vegas, perhaps? The vacation was slated for 7 days, and I knew I was going to have to eat at some point in there. 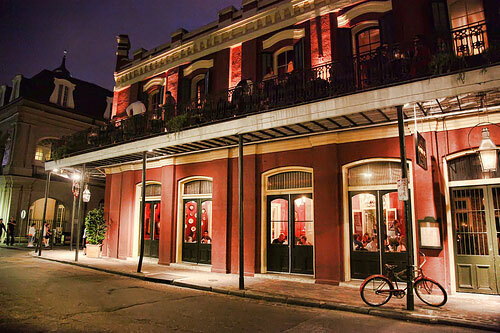 Here’s what I do: I head over to UrbanSpoon.com, where I can look at the menus for local restaurants in New Orleans. I cringe at the prices a little bit, but I figure that even if I end up eating out for every meal, I can still get by on $10 a meal, or $30 a day. I don’t like it, because that’s about how much I pay for groceries in a week at home. But, if I drank water, opted for the vegetarian options instead of the lobster-infused everything, and didn’t let myself get suckered into the abundant desserts, I knew I could get by for under $10 a meal. I did luck out in that I was staying with a host who was happy to let me use the kitchen, although I only ever made a couple of snacks. Since my trip was one day shorter than anticipated, I had plenty of freedom to eat out for every meal. Still, none of this explains the $0 price tag. Enter gift cards. I didn’t buy the gift cards, so I consider them a discount toward the price of my vacation. They’re off-setting cash that I would have otherwise taken out of savings. While I would encourage you to save up your restaurant gift cards for when you are vacationing (why use them locally when you can cook meals at home, after all? ), for me, there was actually just one gift card: an AmEx Style Gift Card. I won this $300 gift card from my employer in a raffle, ironically enough. But, since my food budget was $200, I knew my gift card would cover that expense and some others as well. I used this gift card to buy a Visa gift card instead (and was dinged the $6 in the process), but the near universal acceptance of Visa put my mind fully at ease. Not everybody randomly wins gift cards, but if you do (or get them as gifts), think about saving them for your vacations, where a potential lack of a kitchen can be your biggest obstacle. I got around town mostly on foot, though every host I saw, including the one I stayed with, offered the use of a bicycle. I was also going to use my gift card to get a 5-day transit pass, but it turned out they had stopped issuing 5-day passes right before I got there. No matter, it was an exceptionally walkable city and I hardly used public transit at all. I paid $3.75, over the course of my 6 day stay, to ride the street car three times. Much less than I would have paid on transportation if I had been at home. I also paid $25, again covered by my gift card, to verify my CouchSurfing account. This wasn’t necessary, but I wanted to give to the community, and I felt that being verified would also aid in my attempt to find hosts. Other than one museum, and a couple of books that I bought on my last day when I realized that I was coming in under budget, those were my only expenses. Southwest flight from PDX to MSY -14,880 pts. I found out, as you can see from my expenses, that eating for less than $10 a meal (if you’re eating at local establishments instead fast food chains) wasn’t really practical once you factored in tax and tip. The portions in New Orleans are large enough that you can usually make two meals out of one, however, so I generally did better than $10 a meal on average. I could have saved a lot of money on this part of my trip by utilizing grocery stores more, but for me, the food was one of the major reasons for going to New Orleans. I chose to value that part of my trip with both my time and wallet. Note: The two $25 meals shown above were actually where I bought breakfast/lunch for my host as a thank you. I’m not that spend-happy! While I may have gotten lucky, and while it may not always be possible to vacation for free, it can at least be done for cheap. Without the gift card, I would have only been out $278.60 for my week long trip. Could I have used the gift card for other expenses like groceries? Sure. But this trip was like a psychological reset switch. It forced me to face my fears of flying and solo travel, and it forced me to truly consider the complacency I’d been exhibiting for longer than I care to consider. For $0, I think it was worth it. Article by Matthew Trotter, professional dreamer. Matthew writes at Tao of Unfear about losing a job he was too afraid to quit, and about how he’s using his new found joblessness to face his other fears, while (hopefully) inspiring others to do the same. EDITOR’S NOTE: There are other great travel reward credit cards out there too other than Southwest. If you’re interested, check out my list of a few of them here. Very cool exercise and awesome job for vacationing for near free! If you put your mind to it you can normally find a lot of deals it just comes at the expense of time. Glad you got to go on a vacation and best of luck with the future and your career. Great job with your zero sum adventure in New Orleans! That is a neat idea with the gift cards. There are some just hanging around here, tacked on the fridge, and we never seem to get around to using them. I’ll have to squirrel these away for a ‘cheaper’ vacation..
Well done finding ways to travel on a tight budget! I wish I’d done more of that when I was single and before I had kids – it’s harder to travel on a budget when there are five people going along! bahahahaha awesome. I need to learn how to do this. wow! i gotta tell you, i’m commend anyone brave enough to do the hostel thing. kudos on the vacation, nice price tag;-). Cool project! Excited to see where you end up going next. Great job on getting a free vacation! We used to spend tons of money on vacations, but now we’ll try to travel more locally. BTW, I just quit my job. :) Come by and read about it. @Lance – Yeah! And because they didn’t have much work for us to do there at the end, I got especially lucky. I had lots of time to research while I was still on the clock but they didn’t have anything for me to do. If you’re losing a job, make the best of it, I say. @Jennifer – Exactly! If you have them anyway, you might as well put them toward your basic expenses on a big (or small) adventure. @Stephanie – That sounds like a good rule of thumb for lots of things. I love watching the commentary for independent films and hearing them say “We just didn’t have money for X, so we had to get creative.” They almost always turn out better for the creativity. @B. Rich – Thanks! And the way I see it, most other people are just like me in all the important ways (despite what we see on the news). I’m not going to murder or rob anyone, so it’s a pretty safe bet that 99% of the other people in the world aren’t going to do so either. We’re paranoid about our own safety in America (myself included), but the fact is, it’s mostly harmless. Just don’t poke bears and you should be okay. Haha. @Jenna – Thanks! I was able to find round trip airfare to Buenos Aires for about $500 (by flying out of Florida and using budget/local airlines). But, alas, I don’t have the time or means to take that trip right now. Hopefully within the next year or two, unless I end up going into the Peace Corps (which will also be a free vacation of sorts). @Joe – Travelling locally is great! I’m always finding great new things around me. But I’ve lived here my whole life, and I felt like it was time to experience a new culture and a new cuisine.